Michoacan is one of Mexico's more culturally diverse states, and the capital, Morelia, is the general starting point for many of the tours to colonial and crafts cities, indigeonous markets, pre-Hispanic ruins, places of natural beauty such as Lake Patzcuaro and the island of Janitzio, Chorros de Varal falls, the Monarch Sanctuary, and much more. 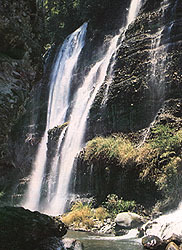 Various local and international tour companies offer their services. Locally, there are many historical sites to see in Morelia, and most can be done by foot, or led by an experienced guide. See What to See for more information. 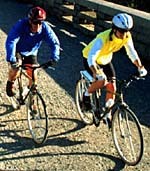 The surrounding areas of Morelia offer many opportunities for the mountain biker or hiker. Lake Patzcuaro has many trails surrounding it and it's only 30 minutes away. You'll find many courses in the hills nearby. Enjoy the open areas and pristine air. Morelia is a compact city easily explored on foot. Begin at the city's zocalo (main square), Plaza de Los Mártires. The facing street (Madero) runs east-west, and splits the city's sightseeing attractions. Perhaps Mexico's most beautiful square, this plaza is bordered on three sides by arches and colonnades supporting lovely colonial buildings with delicate carvings and ornamental ironwork. 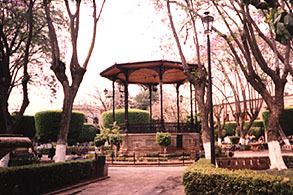 Tall jacarandal trees shade the square's benches and central gazebo. The fourth side (east) of the square is dominated by the imposing Cathedral, also one of Mexico's prettiest. Built between 1640 and 1744, it is a combination of architectural styles and is most noted for its twin 60-meter towers, and a magnificent 4,600 pipe organ. Its doors are covered in handcrafted leather. One of the oldest and most impressive colonial buildings in the city. Built in 1619 as a Carmelite monastery, today it is a fine museum and art gallery with an excellent collection of masks. Its sunny patios and gardens are a perfect place to enjoy the scenery. The oldest and one of the most illustrious institutes of higher learning in the hemisphere. It was founded in 1540 in Patzcuaro by Vasco de Quiroga and moved to its present site in 1580. This is were Father Miguel Hidalgo studied, the leader of Mexico's revolution against Spain. Today, it is a high school and university. Established in 1660 as a Jesuit school and restored in 1970, it is now the site of the tourism office, a library and government offices. The famous Mercado de Dulces (Candy Market) is located on its west side. This museum offers and interesting collection of the state's indigenous people. You'll find a fine display of masks and costumes here. Across from the cathedral is the 18th century Government Palace. Large, interior murals by local artist Alredo Zalce depict the state's history. Memorabilia of José María Morelos y Pavón fills this museum and it was also his birthplace. He was a hero of the Revolutionary War against the Spaniards. A lovely interior garden makes this a nice resting spot. Southwest of the plaza is a splendid 18th century colonial palace that houses a museum tracing the history of Mexico through 1940 (when the presidential term of Michoacan native, Lázaro Cardenas ended). Includes an art gallery, colonial artifacts and religious paintings. This lovely 17th century convent building has a fortress-like design, somewhat softened by its Baroque facade. It houses the excellent Casa de Artesanías, a museum and market filled with fine works of Michoacan art. 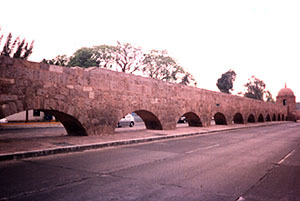 Located a few kilometers east of town is the city's famous aqueduct. This 1.5 km. long, elevated canal was built in 1785 and consists of 253 arches. It is beautifully lit at night, and begins at the city's largest park, the Bosque Cuauhtémoc. There are many small villages and towns to visit near Morelia. Some of the finest arts and crafts in Mexico come from this region. You'll also find colonial towns, national parks, lakes, and even dormant volcanoes nearby. Patzcuaro rests 5 kms. south of the shore of tranquil Lake Patzcuaro and 58 kms. southwest of Morelia. It is the mid point between Morelia and Uruapan. It is famous for its colonial architecture, its Day of the Dead festivities and it's indian market. For more information, click on Patzcuaro. Just 40 kms. southeast of Morelia, Quiroga is a village renowned throughout Mexico for its lacquered wooden products. This is an excellent venue for shopping as artisans from throughout the state congregate here. 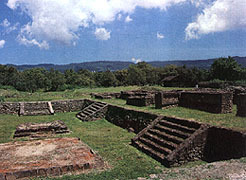 Archeological ruins of Tzintzuntzan Located on a terrace overlooking the eastern shore of Lake Patzcuaro are the remains of Tzintzuntzan (tseen-tsoon-TZAHN), the ancient capital of the Purépecha kingdom. The ruins consist of five yacatas, or temples, that date back to the 13th century. They were erected on a terrace of carefully fitted stone blocks. Below is the 16th century Convento de San Francisco. Uruapan (oo-roo-AH-pahn) is a verdant, colonial city 125 kms. southwest of Morelia and is 60 kms. beyond Patzcuaro. Now a bustling city, Uruapan was founded in 1533 on the site of a Purépecha village. Its founder, Fray Juan de San Miguel, believed it to be the most beautiful spot in New Spain. The area is famous for its delicious avocados and coffee planations. Cobbled lanes lead past flower-filled plazas, ornate colonial-era palaces, and mansions. The city's main site is the Museo de la Huatapera, erected in 1533 as the Americas first hospital. It is now an excellent museum. Just seven kilometers from the city's main square, you'll find Parque Nacional Eduardo Ruíz which holds the headwaters to the Cupatitzio River, hiking trails, picnic grounds, a 220-foot waterfall, and lush surroundings. To the west of Uruapan 35 kms. is the town of Angahuan. It was here in 1943 that the world witnessed the incredible "birth" of a volcano. it erupted in a corn field and grew for nearly eight years before falling silent. The Paricutín Volcano buried the village of San Juan Parangaricutiro and now towers 8,000 feet above the countryside. 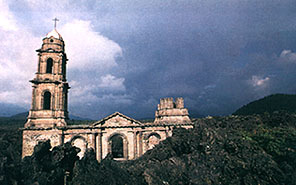 The top of San Juan's church can be seen in the lava field. Each year, tens of millions of monarch butterflies migrate from as far away as Canada to the tree-covered mountains near the village of Angangueo (175 kms. east of Morelia near the city of Zitácuaro). Scientists believe the the migration has been taking place for 40,000 years. They congregate with such intensity that the trees' canopies almost glow a flaming orange color. Butterflies begin arriving in November and depart in April on their trek north. The Mexican government has created eight special sanctuaries, three of which are open to visitors. The sanctuary is open all year. A modest fee is collected at the entrance and guides are available.